The ridiculous "PLANE PARTS evidence"
oslo29112011 wrote: Just a wee bit of unhealthy aviation fascination on the side. Pretty basic stuff, this. Ask the guys at http://www.pprune.org/tech-log-15/ if you really want the component level detail stuff on those engines from hundreds of guys that deal with jet engines every day. Don't troll/shill me. You just lost €1M. Maat! Pls ban this oslo## idiot. He/she is worse than this movie Oslo31august about a similar idiot I was forced to watch (in a real cinema) yesterday. Last edited by whatsgoingon on Fri May 24, 2013 8:09 am, edited 2 times in total. And I do agree with you about the movie, although I worked with the director on a music video once. Nice bloke. I don't know. Can't remember there ever being talk of any 911 victim from here. Maybe someone with a double citizenship or a confusing name? They used the same engine, hence the same turbine. As for the headset. Dropped by a rescue worker, probably. I'll leave 911 alone, I wasn't there, I am not an expert. But, I've got a thing for aircrafts and their engines, and as far as aircrafts go, the official version of 911 sounds the most plausible to me, aircraft mechanics and pilots alike. Why don't you give P&W a call about this, what about the tech guys at pprune or some other aviation professional website? You might be lucky and have a chat with one of the probably thousands of different people that either built, flew or serviced that very aircraft at Boeing, Pratt or UAL. oslo29112011 wrote: I've got a thing for aircrafts and their engines, and as far as aircrafts go, the official version of 911 sounds the most plausible to me, aircraft mechanics and pilots alike. Your "thing" for aircrafts apparently skips over any necessary understanding of the basic physics that propels them through the air. Aircraft mechanics and pilots cannot push an airplane to do physically impossible things, no matter what they tell you they can do. Since you apparently don't have enough sense to question anything about the "official story" despite your "thing" for aircrafts, and given your username is in honor of a clear scam - the hoaxed Oslo bombings - what are we supposed to conclude? You're the first user with a troll name that writes like a troll that isn't a troll? Okay, we'll give you the benefit of the doubt for a bit. Let's see how you play the opportunity we give you to actually show an interest in science and facts. oslo29112011 wrote: Why don't you give P&W a call about this, what about the tech guys at pprune or some other aviation professional website? You might be lucky and have a chat with one of the probably thousands of different people that either built, flew or serviced that very aircraft at Boeing, Pratt or UAL. First of all, if you are really here to help humanity understand these events, do a little research and call them up yourself. We've already shown the serial numbers on the airplanes were bogus or at least the official story about them were. In which case it is disingenuous of you to claim the "official version of 911" is the most plausible. It's "most plausible" that the four alleged 9/11 airplanes are the only airplanes that took off for decades without filling out a flight load manifest each before flying? Hmmm. It's "most plausible" that the "crashed airplane" in Shanksville, Pennsylvania disappeared into the ground where there happened to be a gouge in the Earth that resembles the official "Crash Site"? It's "most plausible" that an engine part to either of the alleged models of airplane which supposedly disappeared into skyscrapers in New York City materialized below intact scaffolding - leaving no trace of its labyrinthine journey through the streets of Port Authority closed-off lower Manhattan? And all the photographs and video would look touched up to alter the state of such incredible "evidence"? That official story and all the ridiculous stories attached to it? I'm sure they would give us a straight answer about 9/11 after lying for decades about that and like missions. 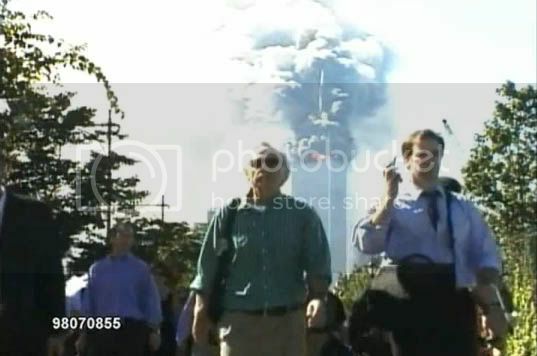 You are clearly a troll if you haven't a problem with the official 9/11 story after looking at all our posts about the problem with the official story and offering no explanation for the fake videos. I am going to suspend you for a couple weeks to give you an opportunity to read a bit, even though I think you are a lying fool. Prove me wrong when you come back. Yes exactly dropped into a totally sealed of FBI area just like the one way sign... Yer right. Re: Why the 9/11 Memorial Wall is Garbage! Hey! They forgot the alleged guys/vicsims from KSA/Saudi Arabia! Shouldn't that country have been first on the wall? Last edited by reel.deal on Mon Oct 01, 2012 8:37 am, edited 1 time in total. 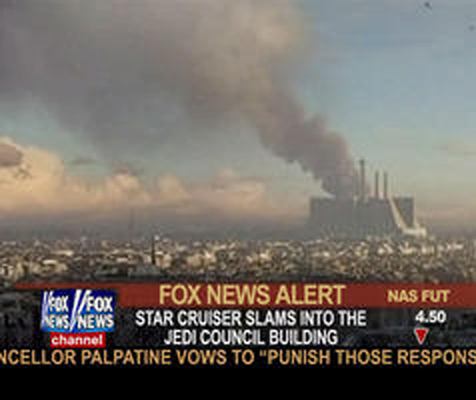 Again with Jedi Council/controlled demolition/free fall Myth?? Like many, I was fed this story when I was growing up. But as I watched the video, I began to realize that all was not as it seemed. And the more I questioned the official story, the deeper into the rabbit hole I went. Presented here are some of the results of my soul-searching regarding this painful event. Like many citizens, I have many questions that I would like answered: was the mighty Imperial government really too incompetent to prevent a handful of untrained nerf-herders from destroying one of their most prized assets? Or are they hiding something from us? Who was really behind the attack? Why did they want the Death Star destroyed? No matter what the answers, we have a problem. reel.deal wrote: So... Thats Our Moon ?!? OMG !!! So... 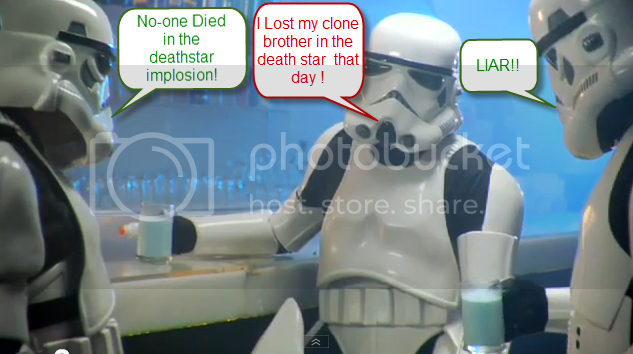 The Phantom Death Star is The REAL Death Star !!! So it never got blowed-up, at all !!! It gets worse, the X fighter disguised as the International space station is actually Darth Vaders X fighter. And the phantom Death Star is actually a remote drone space beam Death Star which is controlled by Darth in the Xf ighter disguised as The International Space Station. 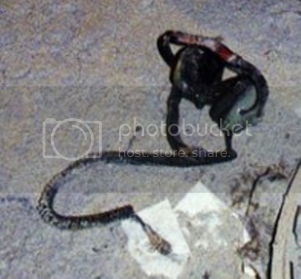 whatsgoingon wrote: Now back to the Headset, which mysteriously appears at the crash site. The headset is a David Clarke panel mount set with a special connector and and a curly-Q cord. Bet that is not the kind of headset you find on a commercial airliner. Whoops. Bad day at the props shop. Hope that guy did not get a raise. Exactly my thoughts, great find there!! Nice work. Yeah, whether it's a likely element to be on the plane or not - it would have been easy enough to copy-paste it from any sort of white-background shot like that product image you found.
" WHAT CRASH ? " "HEY! Is it still $5 bucks 'all-u-can-eat' at 'FAMOUS PIZZA' today ?" Is that a UFO!??! " Last edited by whatsgoingon on Fri May 24, 2013 8:16 am, edited 1 time in total. I'm liking your physics, whatsgoingon. Perhaps one of the strongest antidotes to metaphysics is good-old Natural Philosophy, applied with inarguable estimates and simple logic. Your previous running of the numbers is good, for that parabolic arc. Can I come back to that in a second? ... 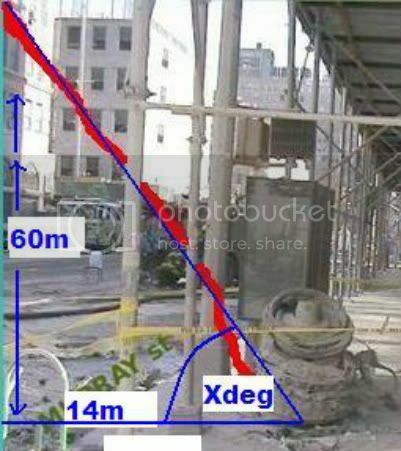 I also thought of something else, mainly because of simon's inspiring little side-view....if you look at the height of the current-day building facing the 'impact' point (see here http://g.co/maps/v4gdg) would you agree that this perhaps forces consideration of a notional silo entry angle for the incoming...projectile?? I'm estimating 60m height for 14 storeys (allowing for HVAC and a potential penthouse on top of the 'Starbucks' block), and basing the overall width estimate of the drop-silo upon the log-jam parked width of 6 Gillig Phantom school-buses, since there's usefully one in the current Google maps picture...so that's approximately 14m including the whole far side-walk...(which as we know from movies, are always wide-enough to take buses ). I am being perhaps too kind for the width of the whole of Murray Street....is it tighter? So tan^-1 (60/14)= 76.8 degrees for 'X' degrees. Or am I wrong with any of the above estimates? But it does seem like an extremely-steep attack angle. And this is where I wondered (and where my maths+physics starts to fail)....your parabolic trajectory equation, if it were to be expressed graphically in terms of a cartesian section superimposed onto a scaled cityscape elevation view just taken from Google maps (hey, a bit like a histogram made of NYC skyscrapers), with a Y-axis vertical displacement of your WTC2 80th floor point of 303m, and an X-axis excursion just to the top of the drop silo....is there any kind of final descent intercept point that could be argued, to defend the supposed ballistics of the fall-of-shot?? My gut feeling is a no.....but maybe I'm wrong.